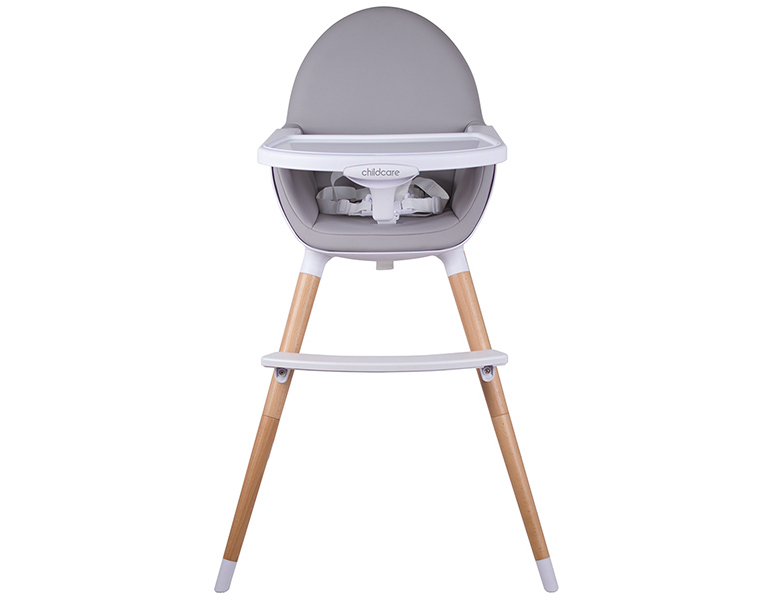 Easy to clean, easy to store, easy on the eye and preferably something your Houdini baby can’t escape from – these are MANY OF THE THINGS you need to consider when buying your first high chair! 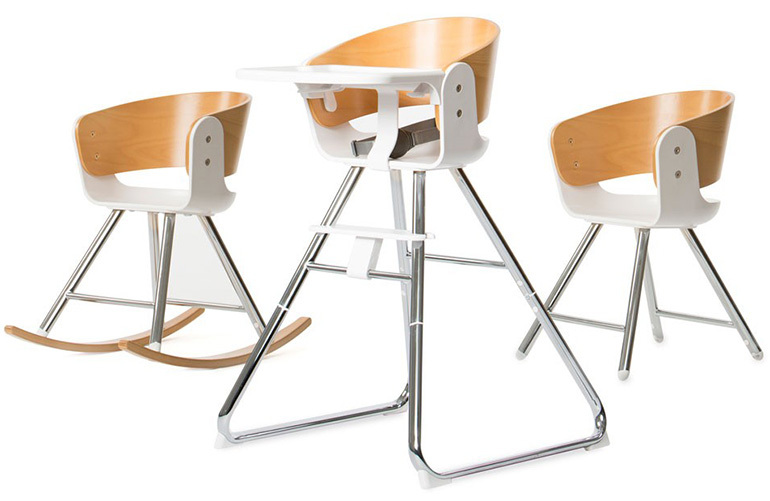 High chairs have come a long way in design and function in recent years. These days you can have all manner of adjustable seating, foot rests, double trays, you name it. Heck, you can even buy high chairs that transform into can’t-quite-believe-it stunning pieces of furniture. Rice cereal and apple puree at the ready? Come see our pick of the bunch of high chairs. There’s something to suit every high chair buying budget! It’s not hard to see why the Ikea Antilop has a cult-like following. Its no fuss, minimalistic aesthetic makes it a breeze to clean – you can even take it outside and hose it down. Or pull the legs off and chuck the whole thing in the dishwasher. And at just $24.99, it’s a dinnertime steal. The contemporary iCandy MiChair ($549.95) may cost a little more, but you get a lot of high chair bang for your buck. It’s not only for luxurious dining, but also morphs into a stunningly crafted piece of furniture for your young child. Suitable right from birth with the iCandy Pod (available separately), the MiChair provides snug support for little ones. When you’re not using it to feed baby, the MiChair converts to a baby rocker on the floor. Later down the track, it becomes a junior sized chair or rocking chair, suitable for children aged up to six. 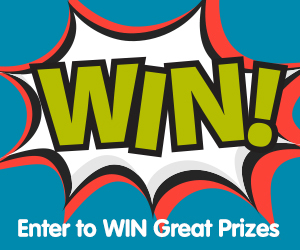 And did we mention it’s SUPER easy to clean! Want a convertible high chair option which will see you through from baby to far beyond without blowing this month’s entire grocery budget? It’s the Ikea Langur ($119) junior high chair. A high chair which grows with your kids, but at a budget price, the Langur transforms into a junior chair, perfect for pre-schoolers to be sitting at an appropriate table height. It comes with a detachable tray for those baby years. 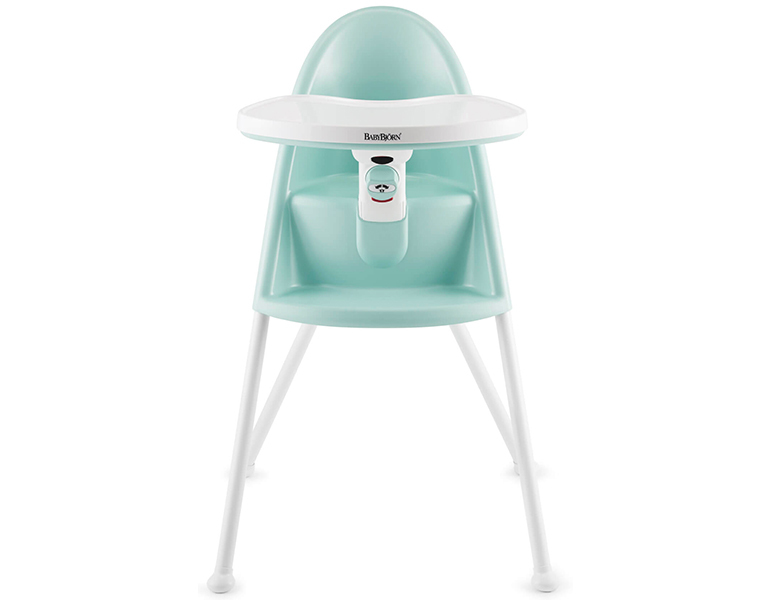 With its super swish look, it’s little wonder why Childcare The Pod high chair is a crowd favourite. Its easy to clean white plastic shell, grey padded seat and timber legs are bang on trend and at $149, it’s pretty sweet on the hip pocket. Designer looks on a discount budget? It’s a YES from us. 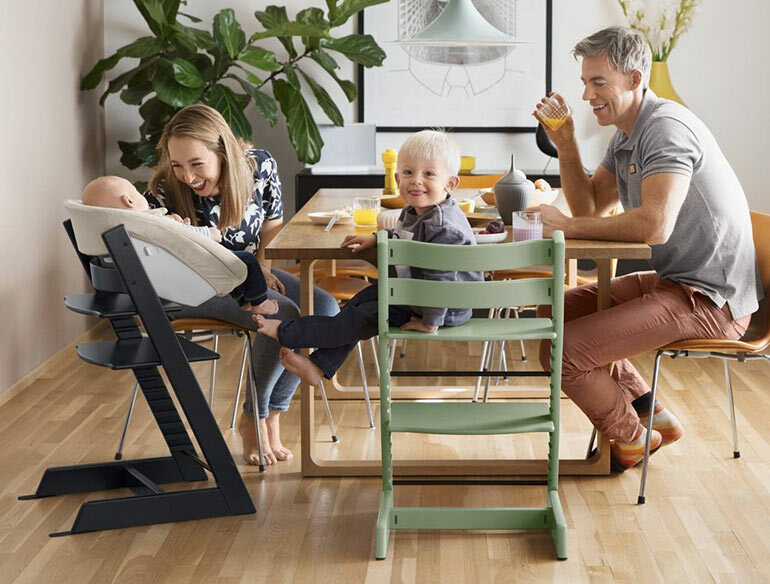 The Stokke Tripp Trapp ($329.99) is as popular as ever and families all over the world love its timeless, convertible design. Available in just about every colour under the rainbow, along with natural timber finish options, this is one stylish piece you’ll love to see around your family table for years to come. 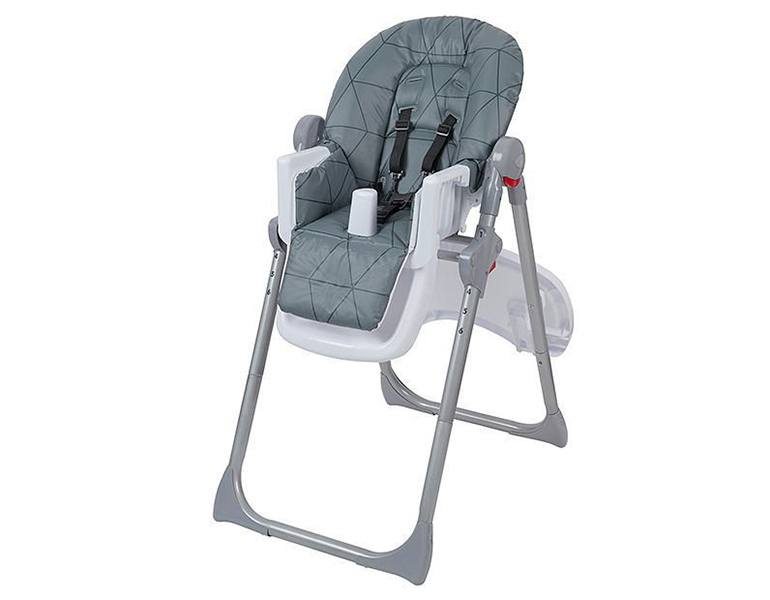 Suitable from babies aged six months (using the Baby Set) up to adults weighing 110kg. Prefer a padded seat for baby? 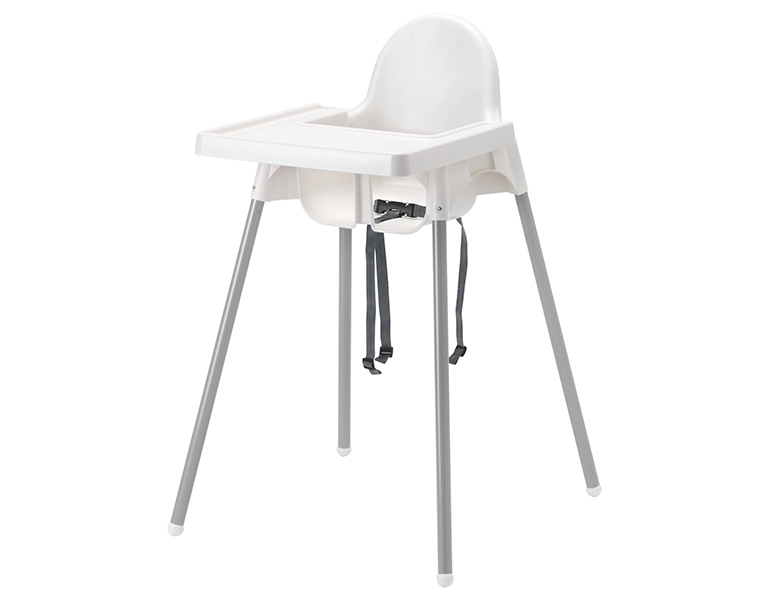 The Target Mealtime high chair ($89) has many of the mod cons you see in higher end models. Adjustable seat height positions, seat recline and a flat storage fold is just the start. We also love the handy on-board tray storage. Plus, the padded seat wipes clean and lifts right off too so you can clear all the crumbs and half-chewed toastie fingers sure to gather underneath. A highchair and a toddler chair in one, the Skip Hop Tuo convertible high chair ($279) ticks the stylish and easy to clean boxes. The reversible seat pad and wipe clean seat will withstand many a squished banana and the removable tray can go in the dishwasher for easy cleaning! Suitable for children aged six months to five years. 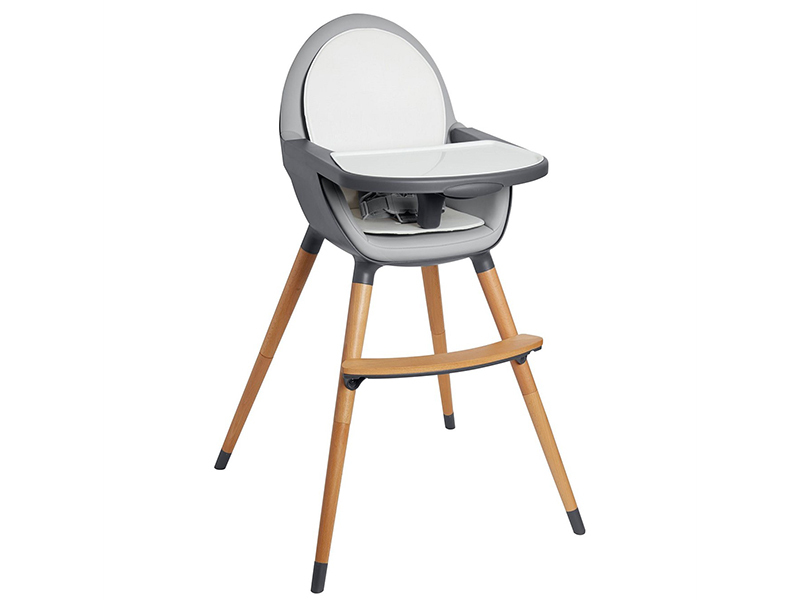 With tray space plentiful, phil&teds poppy high chair ($149) is fit for a junior size buffet! Easy to clean, the waterproof and seamless aerocore seat means there will be no crumbs or titbits of food left behind to fester. 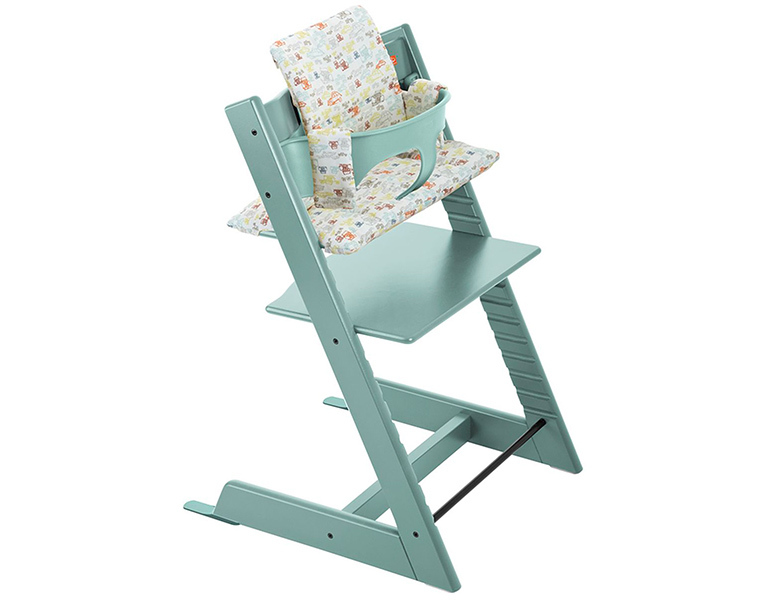 While the poppy high chair DOES store away with barely a footprint, you’ll be pleased to know it can hang around long after the first year, as it changes into a junior sized chair. So awesome. Available in black, cranberry, lime and bubblegum. 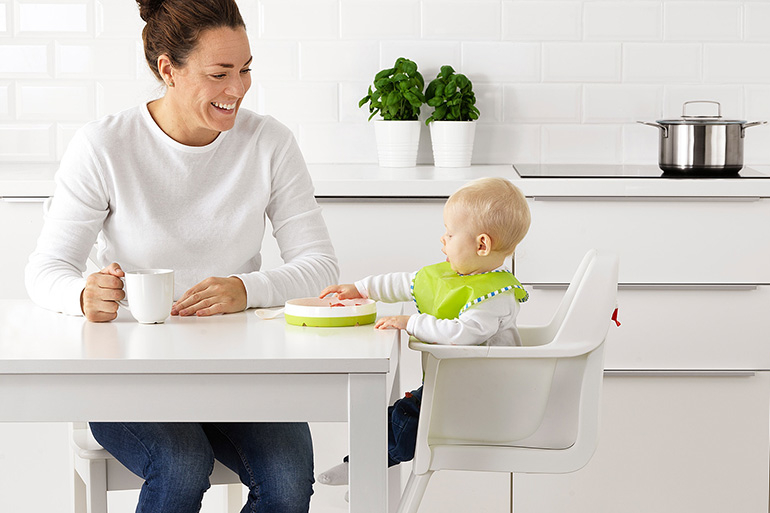 Your baby can sit at the table from their very first family meal in the OxoTot high chair ($399). A wonderful investment, this chair has won a stack of design awards and is suitable for babies aged six months and beyond. 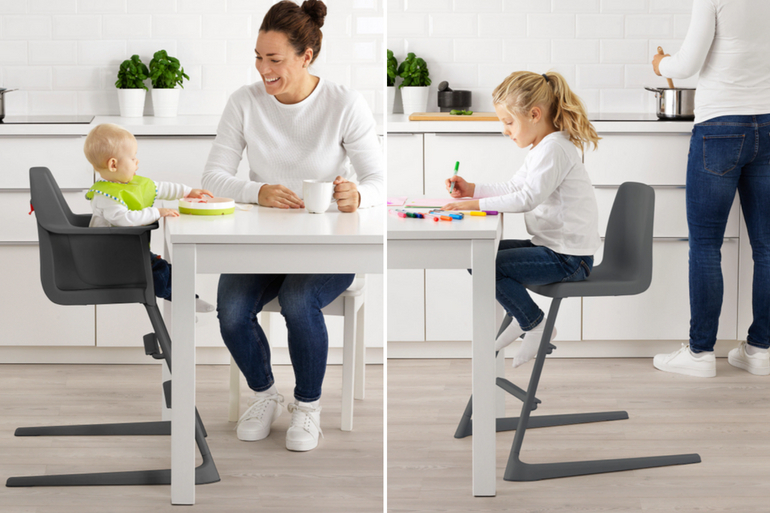 For preschoolers, the seat post, tray and harness can be removed, allowing kids to still use their chair to sit more comfortably at the table. The seat is contoured too to protect tiny postures. Which is super important if you have a very slow eater! Did someone say ‘a childproof lock that can only be opened by an adult‘? 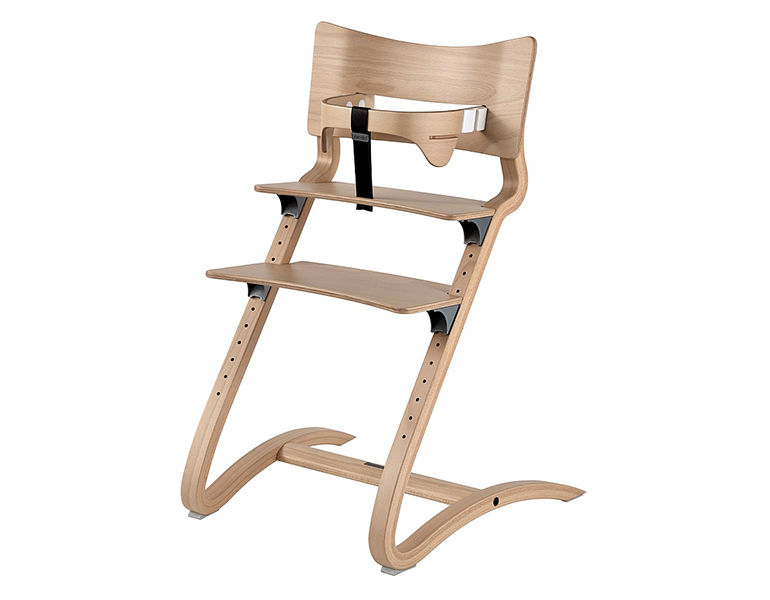 The BabyBjörn high chair ($349.95) has exactly that, making sure your baby is safe as houses when seated. 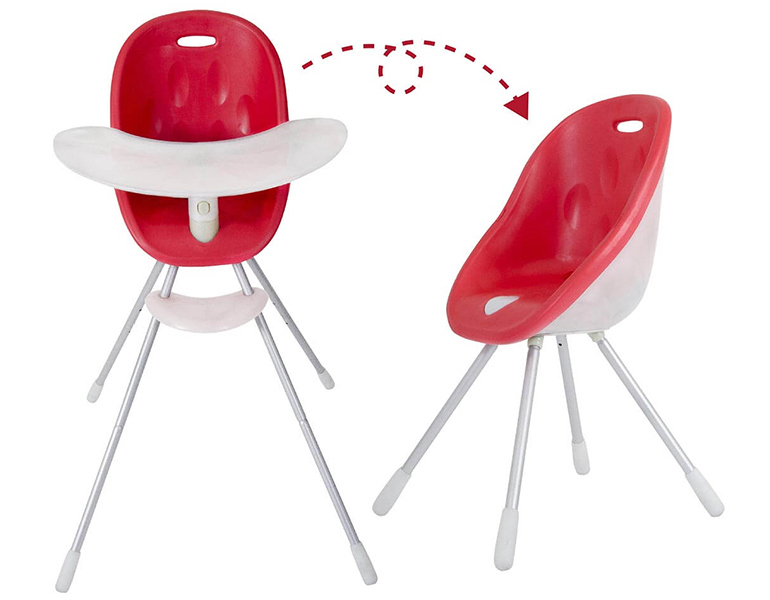 Super easy to clean, this high chair features a solid curved backrest to assist little ones in sitting upright when eating. Perfect! The Mocka Original high chair ($129.95) continues to be one of the furniture giant’s best selling high chairs and it’s easy to see why. 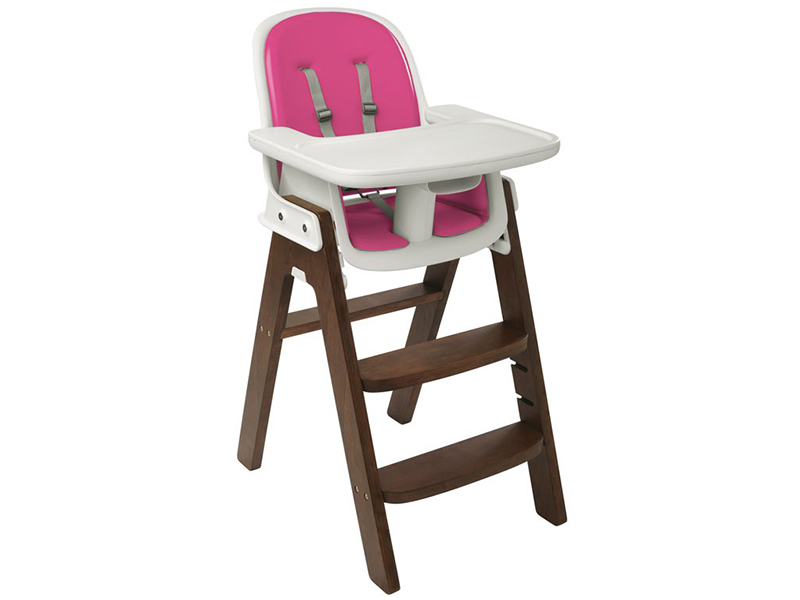 A timeless design with adjustable tray settings, seat and footrest heights, this high chair will see you through from first solids through to school-age dining. Here’s proof that you can have your high chair, and good looks too. Imagine this beauty pulled up to your dining table. Ergonomically designed to give your child all the support they need, no matter if they’re eating breakfast or doing their homework. 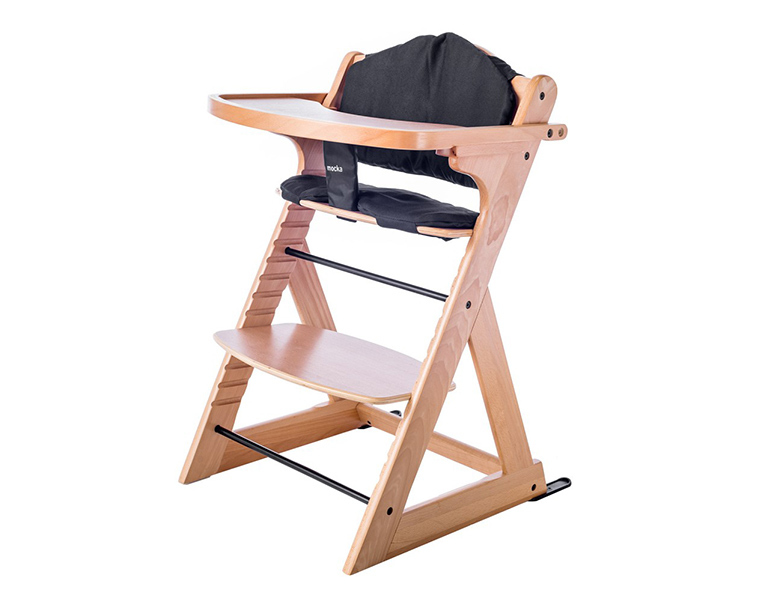 The Leander high chair ($319.95) is made from glorious beech timber and weighs just six kilograms – yet can hold up to 130 kilograms in weight. Amazing! No space for a high chair? No matter! 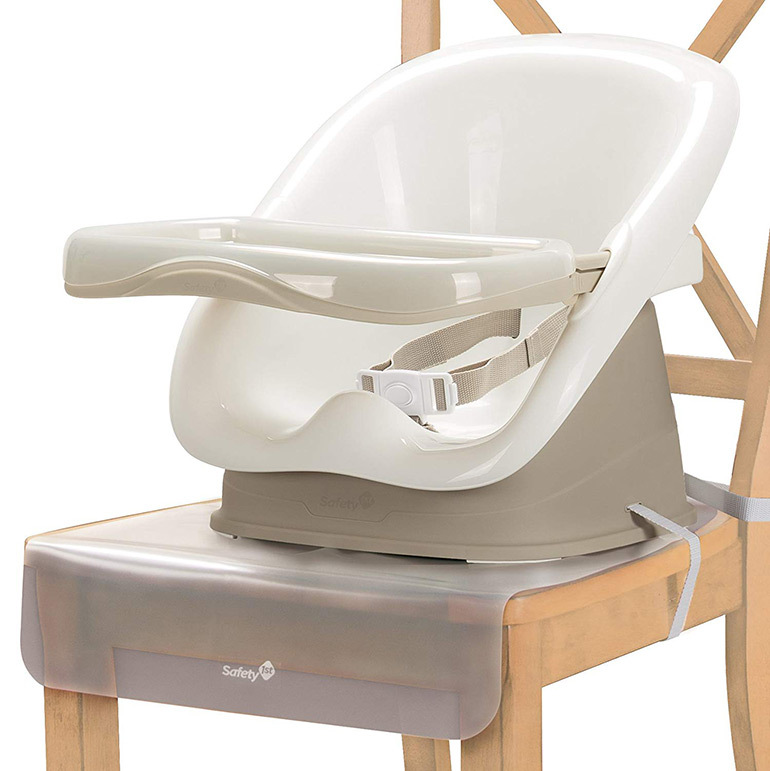 The Safety 1st Booster seat ($59.95) is an awesome solution which uses one of your own dining chairs. There’s no nooks or crannies with this easy to clean design, a simple wipe over with a damp cloth is all it requires. Suitable for kids aged six months to four years, you can stake it to grandma’s house or your favourite cafe too. There you have it, 13 of our favourite high chairs to see your little one through countless family dinners! 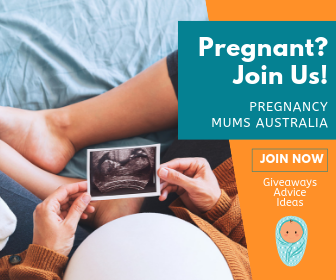 Make sure to check back soon for a round-up of our favourite prams. And if you want some food ideas to dish up to baby so you can test out how easy your chair is to clean, then check out these easy baby food puree recipes. ALL highchairs should have a “foot rest” for littlies to rest their feet on, not have their legs “dangling”. Professional theory I read is that legs pressing on the front of the chair with nothing to relieve pressure can cause discomfort and cramps in their legs. Little ones their prefer to get out of highchair because of discomfort rather than stay there and eat.